and change existing trainees to managers. Although everyone is a trainee, you can select which trainees can also sign in to your account on Warp Studio. These are called managers. You can add an unlimited amount of managers to your account. Managers can sign in by email and password, or alternately trough employee number. To add a manager, go to 'Trainees' or your Account Settings, and press 'Add user'. Next, fill in their credentials and make sure to select the option 'Manager' under 'Add this user as a team member'. You can fill in a unique employee number if you wish this manager to sign in with their employee number (you can always change a manager's credentials later on). You can directly see the temporary password which the manager needs to change when they sign in for the first time. The added manager will be emailed with their temporary password and a link to the sign up procedure. All managers can be viewed in your Account Settings. 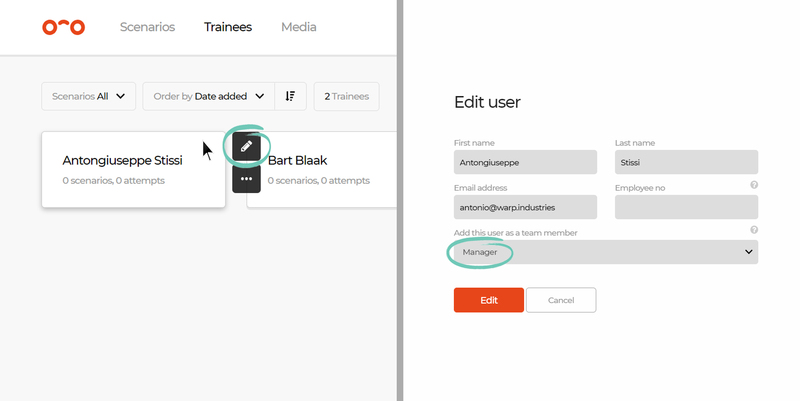 Existing normal trainees can also be changed to managers, by pressing the 'Edit' icon upon hovering your mouse cursor over them in the 'Trainees' tab.